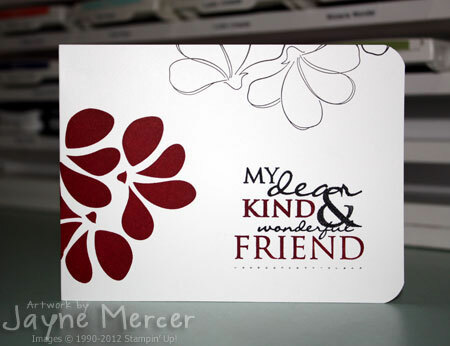 Clean and Simple is probably how I would label my own stamping style. However after a bit of a break from stamping I was feeling a bit rusty so I signed up for a Clean & Simple online stamping class that started a few days ago. On Day 2 the lovely Julie Ebersole demonstrated a stunning card which I had to case immediately. I adapted it to use SU! stamps and inks and I'm really happy with how it turned out. A lovely CAS card. I'm really enjoying the class - lots of great tips. This is such a gorgeous interpretation of Julie's card! Lovely, lovely, lovely! Always inspiring Jane! this reminds me of the Timeless Portrait fabric in Cherry cobbler. Love the simplicity.